Great San Luis Obispo Title Sales Manager - Stacy Gregory! Stacy Gregory is a County Sales Manager for First American Title Company in San Luis Obispo. Stacy has a positive attitude and is always ready to help with anything. Stacy has been a helpful part of my Real Estate team. She has helped me with no hesitation on getting information and helping me close deals with ease. Stacy is approachable, eager to help and always open to new ideas to help agents be more efficient and help us get our job done faster. Thank you Stacy for all that you do and your commitment to being the best at what you do. I am grateful for it! Contact Stacy today to help you get a great Title Officer on your side for you next Central Coast escrow. 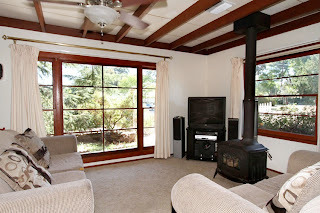 If you ware looking to sell or buy a home in SLO County, give Traci a call. 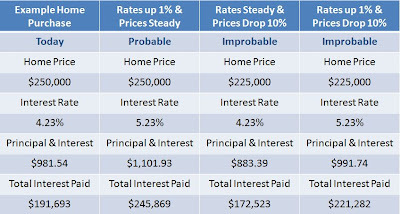 Cost vs. Price in San Luis Obispo - What higher Interest Rates can do to your purchase power. 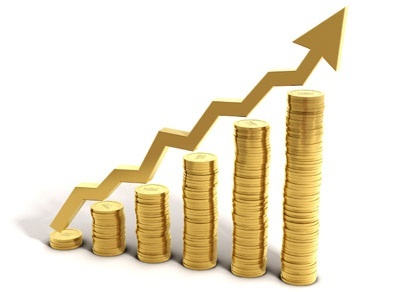 A good rule of thumb is for every 1% increase of interest rate there is a 10% decrease in purchase power. It's surprising to most buyers. This new year is going to bring many new opportunities to find a home. If you are still possibly considering a purchase you may want to know this very important particular bit of information. The higher interest rates go, the less home you and your family will be able to afford, finance or purchase. If you were looking at property in the $500,000 range and interest rates were at 4.23% now they will eventually steadily be going up to 5.23%, meaning that if you wanted to keep your mortgage payment the same you would only be able to purchase a $450,000 home. Even with a 1/2% change in interest rate it can effect your purchase power greatly. I recommend getting back into finding a house as soon as possible to get the most house for your dollar, before interest rates go up and property prices stay the same. 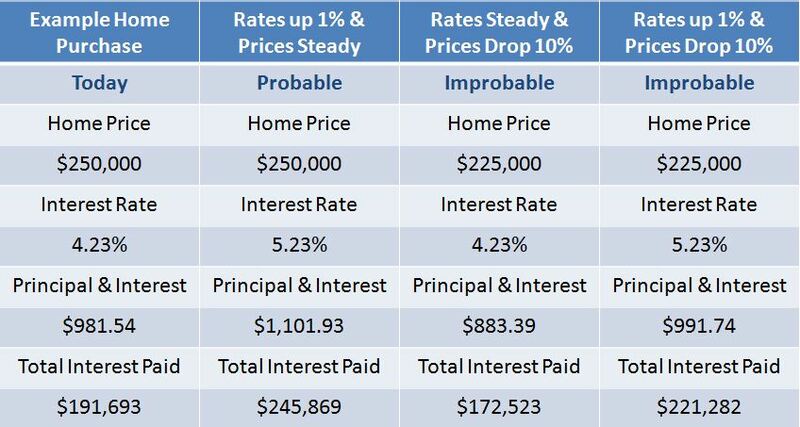 Please see this example to show your buying power depending on what interest rate you lock your loan in at. As a buyer it's vital to know your market and what options you have. I'm here to guide you through the process. If you have any questions about this I would be happy to explain it further. If you are interested in looking for a home in the San Luis Obispo County area, please call me or email me I'd be happy to help. San Luis Obispo is the Top Four Happiest Place in the World to live! Our little town of San Luis Obispo is going to be on the Oprah Winfrey Show. It has been my home for over 13 years and I wouldn't trade my city in for anything. Author Dan Buettner who wrote Thrive, by measuring and experiencing happiness day-to-day he found you could define happiness and pin point locations that had the most overall happiness qualities. He traveled all over the world to find the best places to live in the world and San Luis Obispo made the top four. We were the only US city to make the list. Happiest place in Europe was Denmark, Asia - Singapore and Nuevo Leon - Mexico. Congrats! San Luis Obispo... see more about San Luis On Oprah! 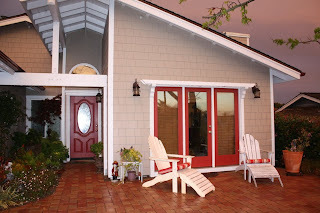 Interested in moving or purchasing a home in our glorious City of San Luis Obispo? click here to see available homes. Or email me with any questions you have, I'm a great tour guide. Your San Luis Obispo Business can help the planet! If you are within the PG&E (Pacific Gas and Electric) jurisdiction your small business should be a member of ClimateSmart! I challenge all businesses, ecoBroker's, Green or Sustainable Business and Realtors to get on board. It's a simple voluntary and charitable program that gives your business the opportunity to take action against climate change by making your energy use "climate neutral". Many people feel that doing what you can as a business or home owner to reduce your carbon foot print is a priority. This is a small way that you can do it for just pennies. 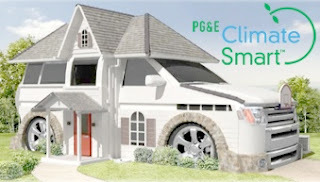 Typically the monthly cost for participation in the program is $0.00254 per kilowatt–hour for your electricity useage & $0.06528 per therm for gas usage, or about $5 a month for the typical Northern California home. Is it deductible as a business expense? This is a valuable opportunity to communicate your commitment to environmentally responsible business practices and a commitment toward a cleaner planet. 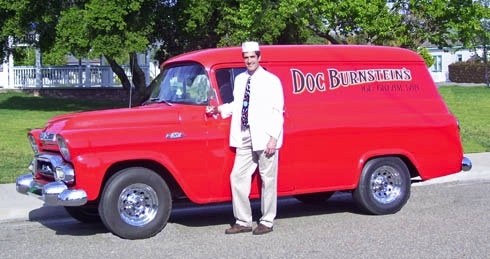 Local Business - Doc Burnstein’s Ice Cream, Make your own flavor! Doc's Ice Cream Lab is a great local business to explore your inner child, or bring your child. :) Every Week at Doc's the Ice Cream Lab technicians put on a show and make ice cream with your help. The audience helps invent a new ice cream flavor during a 30-min skit. After the flavors have been put together you get to try it afterwards!! So fun. 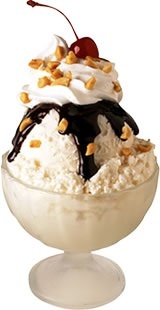 The latest flavor creation was Crème Bru-licious a Creme Brulee Ice Cream, w/ Marshmallows, Chocolate Chips & Brownie Pieces. Created on January 19, 2011. Go to Doc Burnstein's website and print your free ticket to attend the next Show. Reduce Your San Luis Obispo Property Tax Bill! Do you own a home in San Luis Obispo that has declined in property value? In California we live in a high property tax area and you can save a bundle by fighting your assessment. The County has been reassessing properties all over, but they haven't yet gotten to everyone. You can do something today to get your home reevaluated. Doing it yourself can seem like a daunting task, but there are easy steps to reduce your bill to a much more realistic value of your home, lot or condo. 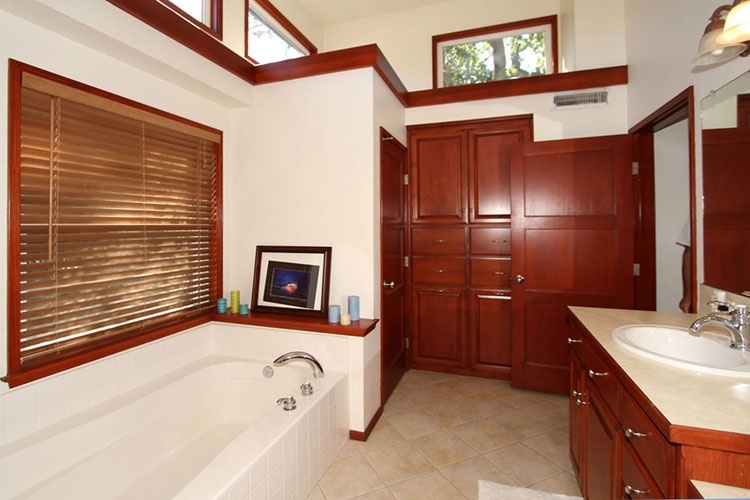 Let's say you live in San Luis Obispo and the value of your home has reduced from $600,000 to $450,000. A huge drop! A reassessment of your bill could lower your annual bill from approximately $7,500 to $5,625, an annual savings of $1,875. That's two round trip tickets to Italy! SLO County has a website that walks you through the process. The "Decline in Property Value" Application is available to download and fill out. There is even a Decline in Value Estimator that can tell you if you are eligible for a reduction. You will need your 9-digit Assessment Parcel Number (APN) to do it. The Parcel number is on your annual property tax bill. You will also need to put in a fair market value of your home based on homes that have sold in your area recently. A Realtor can get you this number, email me if you need a more accurate number. Then it spits out your revised Assessed Value. Then fill out the "Decline in Property Value"form and get the county moving on your reassessment. Do wait till they do it, it could take years. If you aren't up for the task you can outsource the work to a local real estate lawyer or a property tax appeal expert. They will handle everything and charge 25%-50% of your first years tax savings. I recommend doing it your self, SLO County makes it simple to do. Are you in the market to buy or to sell your home? Give me a call today! A Great SLO County Loan Officer - Michael Hunstad! Today I would like to tell the world about Michael Hunstad. He's a Senior Mortgage Loan Officer in Santa Maria, CA for Guild Mortgage. 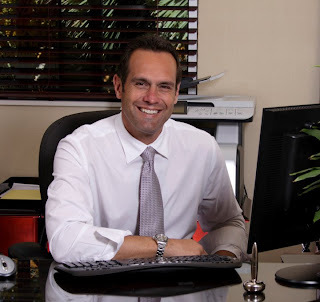 I recently did a deal with Michael and his time and attention to finalizing our deal was amazing. His incredible staff returned calls and got answers to questions promptly. He was a great asset to the closing of my deal. As a Realtor it's a privilege to work with professionals that never get in the way of a deal and Michael and his staff did just that. If you are looking for a loan or would like to talk to a reputable loan officer give Michael a call 805-448-0348 or email him directly. 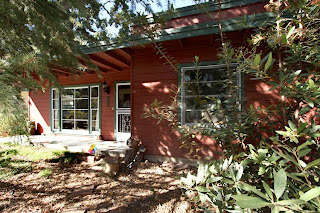 1031 Exchange in San Luis Obispo - What Investors know! When you own a home or business and you would like to sell your property and move into a larger home or buy investment property, there is a way you can save on taxes. That you should know. 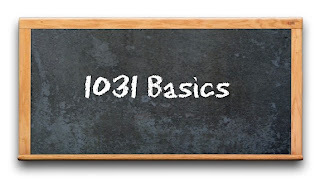 Recently Jay Peet from Investment Property Exchange Services spoke to us about how a 1031 Exchange, works and how investors can save on transferring funds from one property to another. It's the exchange of property to a like kind property where any capital gains taxes would be deferred. There are rules and guidelines to follow depending on the type of property. L - Like Kind: The sale of your property must be of like kind to the replacement property, meaning that they are both being held for investment purposes. You can't go from a sale of an investment property to a purchase of a primary residence. T - Time Frame: When your escrow closes on the sale of your property the clock starts and the exchanger has 45 days to identify a replacement property and 180 days to close escrow on the identified property. V - Vesting: Whoever is on title of the sold property will be on the title of the purchased property. The relinquished property must be the buyer on the replacement property. V - Value: The exchanger must purchase the replacement property(s) using all the cash money from the sale of their relinquished property to defer 100% of the gain. If any of the cash is pulled out from the sale of the sold property that money would then be taxed. The purchase property must be equal to the net sales price of what they sold. 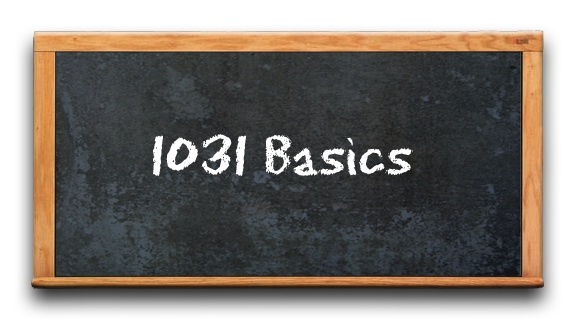 If you would like to sell your San Luis Obispo investment property through a 1031 exchange, contact Traci for your buying and selling needs. I'd be happy to help. For 30 days in the month of January enjoy 3 Courses for just $30 a person. Enjoy incredible meals at a resonable price. Over 30 destination restaurants throughout SLO County offer a great deal to taste our county cuisine. Each participating local restaurant offers one fixed price three course meal for just thirty dollars per person. Many participating restaurants also offer special paired local wine choices, for an additional charge. SLO County has a large variety of premium restaurants, due to the growing local wine industry, and a vast array of locally grown fresh food. Visit the Restaurant Month Website for a complete list of participating restaurants & sample menus. Participate in supporting our local businesses and restaurants today! 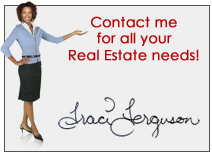 When you are ready to buy or sell your home in San Luis Obispo, contact Traci, your local expert. 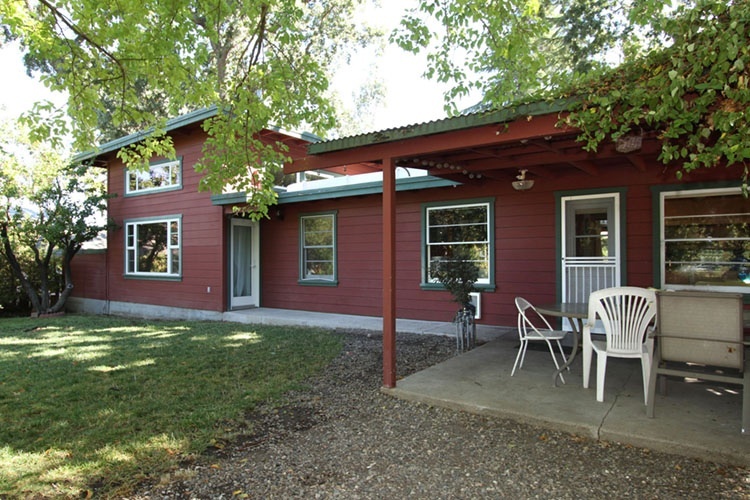 Screaming Deal of the Week in Atascadero! This Short Sale is located at 8050 Atascadero Ave. for $279,000 This home is sheltered from weather in a forest-like grove of magnificent 100 year old oaks and pines. It is located in a desirable, family -friendly neighborhoods, with schools and parks near by. Atascadero Lake is just a short walk away. This home exudes a warm and inviting atmosphere, with large windows, an authentic wood-burning stove and the feeling of living in a cottage in the woods. The master suite addition features a large bedroom area with high cathedral ceilings and plenty of natural light. The bath has been well designed to pamper the residents and includes dual sinks with make-up vanity and separate tub and shower. The master suite could be converted into its own separate living unit (with a kitchen already plumbed into the large master suite closet). A second entrance has been framed in for a second street access. This 1,584sf, three bedroom, two full-bath home is located on a third-acre-plus lot, with unlimited possibilities for play, garden or expand. 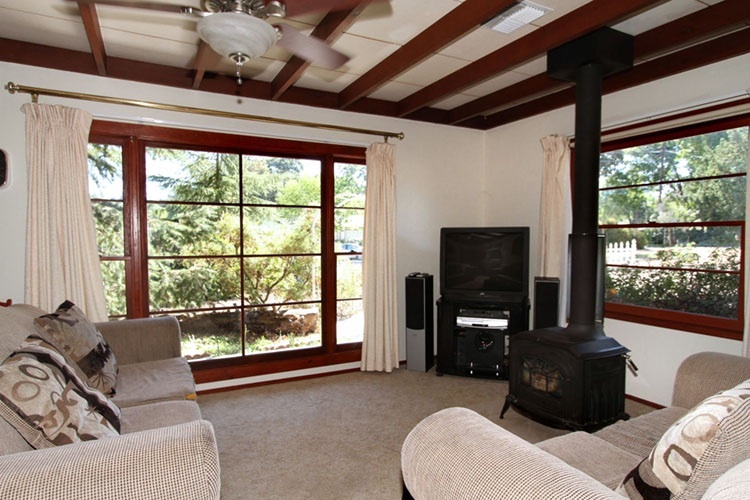 • Located a short walk from Atascadero Lake and Pavilion, the lake has a walking path around it, park, zoo and ball park plus other points of interest. For more photos or information on the property email Traci or call the number below. Thai Talay - Local San Luis Obispo Business Spotlight! I have the pleasure to tell you all about an amazing local Thai Restaurant located in Pismo Beach CA., Thai Talay. I have been a big fan and a frequent patron for over five years. 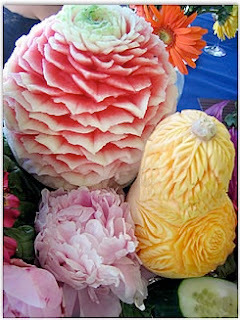 They have consistently been a delicious place to enjoy a great meal with friends or clients. Thai Talay has recently added cooking classes, held once a month, at Thai Talay to give any budding chef the skills and points to being a great Thai cook at home. I had the pleasure of attending their first Cooking Class this past November. Head chef Jay, taught us how to make Panang Curry and Fresh Spring Rolls. Chef Jay was patient with her 20+ students and her sweet Thai accent was delightful and her humor made the event a true fun success. I highly recommend attending any or all of the classes. I look forward to the Thai Vegetable Carving class that will be special treat to watch and learn. Their Thai Cooking Class Schedule is available on their website. If you don't feel like doing the cooking, Thai Talay offers online delivery orders and catering for your special event all on their website. Now do your taste buds a favor and go enjoy an amazing meal at Thai Talay! If you are looking to sell or buy property in Pismo Beach :) Contact Traci today! Ian Parkinson's official swearing-in ceremony - will be on Monday, January 3rd at high noon at the County Government Center which is located at 1055 Monterey Street in San Luis Obispo. Join him for the ceremony and for light refreshments afterwards. Ian has been the San Luis Police Captain and has stepped down to be the new city Sheriff. 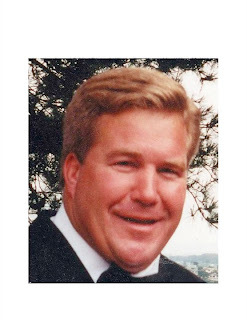 In recognition of his outstanding service, he was twice awarded the department's “Distinguished Service Award.” In 2004, Parkinson was awarded the City of San Luis Obispo Employee of the Year Award for his outstanding service to the City. Click here for more information on our new Sheriff. 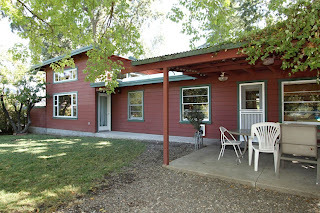 Click here if you are looking to buy or sell a home in San Luis County.